What do you do on a Miami weekend getaway? Relax on the beach, enjoy the sun, get a massage, have a great dinner, shop - and, if you like, party in South Beach! 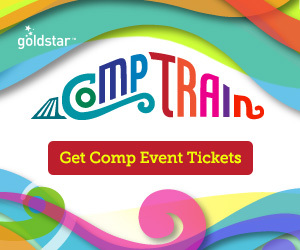 It's a great place for a girlfriend getaway. Miami is a beautiful city, with great weather all year round. If you're lucky enough to live nearby, you can do a Miami weekend getaway any time you'd like - for the rest of us, it's a winter getaway destination! You can drive into town if you live in Florida; otherwise it's best to fly in. The airport isn't far from downtown and your Miami hotel. Once you're settled, you can get around the central city on the MetroMover - it's free, and easy to use! MetroRail will take you farther, if need be. But you can get to many places of interest, like Bayfront Park (pictured above) and Bayside Marketplace, on the MetroMover. Hotels in Miami are available in virtually any price range. 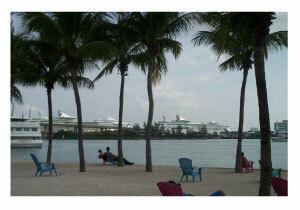 There are many to choose from in the downtown area, near the cruise ship ports. The Hotel InterContinental Miami is a very nice Miami hotel; it's right on the harbor and within walking distance of American Airlines Arena and Bayside Marketplace. I've stayed there and it's a lovely Miami hotel. 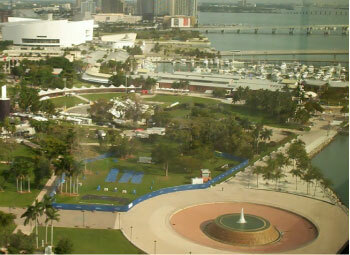 The photo at right was taken from the Intercontinental; the white building in the back is the AA Arena. You can see that it's within walking distance; the area just before the arena is Bayside Marketplace. In between the Intercontinental and Bayside Marketplace is a lovely park along the harbor, with a fountain in the center. 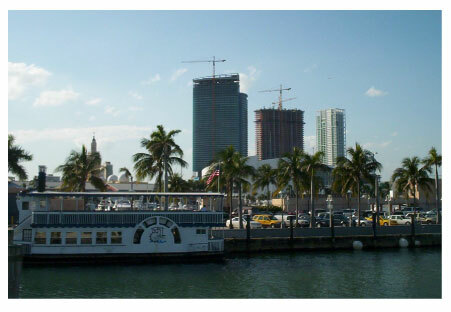 For a more affordable hotel in the area, try the Holiday Inn Port of Miami Downtown. It's in the same vicinity, on the other side of the AA Arena. Compare prices for all Miami hotels and read what other travelers have to say about them at TripAdvisor. The most important thing that should be on your agenda during a Miami weekend getaway is to RELAX! Laze on a beach in Miami, get some sun, and try to do nothing for awhile. While you're doing nothing, how about a massage? Miami has lots of spas - and they participate in "Spa Week" every spring and fall (offering special prices for spa services). There are day spas, and resort spas. The Mayfair Hotel & Spa is a nice little boutique hotel in the Coconut Grove area, with a full-service spa. The hotel is charming - although not in downtown Miami, it's also worth checking out. Once you're well-rested, head out for some shopping. Bayside Marketplace, mentioned above, has hundreds of shops and restaurants, many of them operated by local vendors. The Design District, just north of downtown Miami, has boutiques, galleries, and restaurants. Brickell, south of downtown, was originally a financial district but now houses trendy shops and cafes. All can be reached via MetroMover and a short walk. If you enjoy nightlife, head across the bridge to South Beach. There are tons of bars, restaurants and clubs, and plenty of Latin music! You can also just wander - during the day - and enjoy the Art Deco architecture and colorful buildings. You'll also get a good view of South Beach and the mansions along Biscayne Bay on a boat tour - there are lots of vendors along the harbor for you to choose from. Spend another day exploring the neighborhoods - Little Havana, of course, and Little Haiti. Enjoy some of the flavors of the culture with lunch in the neighborhood. 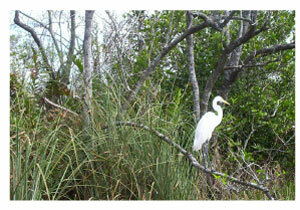 If you have another day, take a trip to the Everglades. There are plenty of tours available, and they are very careful to disturb the area as little as possible - but you get a closeup view of gators and egrets, and it's a wonderful experience. Miami is home to many great restaurants, but the one thing you have to try is the Cuban food. With a large Cuban population, you know that it's good and authentic. Tuto's Place is one of the best. Good home cooking, Cuban-style, and very reasonably priced. If you're shopping in the Design District, stop at Michael's Genuine Food & Drink. It's ever-changing menu is always a surprise, with selections from farm-fresh eggs to octopus. Very innovative and adventurous for you and your foodie friends!